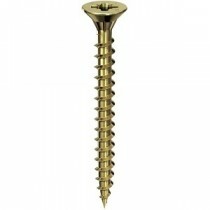 The C2, a high performance Multi-Purpose screw offers a number of unique features. A deep recess and double countersunk with ribs for improved countersinking, giving a smooth flush finish preventing splitting and material damage. These screws are coated with a high-molecular polymer lubricant reducing insertion torque by up to 52% and increase rust protection up to 20 times longer than a standard zinc plating. The classic thread gives ultimate performance and an exceptionally high pull out resistance.